Can You Combine an MBA and a Master’s in Nursing? 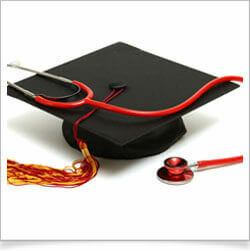 While you can’t earn an MBA in Nursing, you can now combine an MBA and Master’s in Nursing. Designed for healthcare administrators and those hoping to work in leadership positions, the program is open to those who already have an undergraduate degree in a related field. Most nursing positions today only require an undergraduate nursing degree, but if you want to make more money working for a hospital or a clinic, you’ll want to think about coming a master’s degree with an MBA. When you combine an MBA and master’s degree in nursing, you can expect to take courses that apply to the healthcare, nursing and business fields. Most programs consist of several core business courses, including management, corporate finance, the legal implications of operating a business and at least one ethics class. You’ll also take courses that relate specifically to nursing and the healthcare field, including classes on the future of nursing, nursing leadership and management and operations of the healthcare system. Some courses may also require that students attend multiple seminars on both business and healthcare topics. Those who combine an MBA and master’s degree in nursing have access to more job opportunities than those with only one of the degrees has. Graduates from these programs work as the Chief Executive Officers at major hospitals and hospital chains around the world, but they also work as Chief Financial Officers for hospitals and clinics. Hospital administration, health information managers and pharmaceutical sales representatives and managers are other jobs open to graduates. Pharmaceutical sales reps make around $58,000 a year, according to the Bureau of Labor Statistics. Those in charge of managing those workers may make even more. Why Combine the Two Degrees? Combining the two programs opens up more options for you in the future. If you want to work in the healthcare industry as a manager or an administrator, you need a strong background in both the healthcare field and the business field, but you’ll develop that background in one of these accredited programs. These programs also give you the chance to do an internship with a local hospital, which helps you learn more about the operations of a major hospital and the duties and tasks associated with certain job types. Many schools also have a strong career development office that can help you find a job before you graduate. Running a hospital, a clinic or a doctor’s office is similar to running any type of business. You need to keep customers happy, handle issues with employees and keep the facility running at a profit. When you combine an MBA and Master’s in Nursing, you’ll learn how to do all the tasks associated with healthcare administration jobs.